Available at Amazon.com for $54.00 Make sure you get the 2nd Edition. 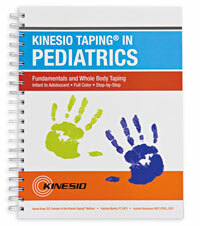 This user friendly text gives step-by-step, color illustrated instructions for the use of Kinesio Tape in Pediatrics. The book describes the many uses of this technique to gently realign the tissues and improve function.